Caladiums are tropical plants growing from tubers, most known for their colorful foliage, and used as a houseplant or summer bedding plant. These colorful plants are members of the Arum family, and you can find thousands of cultivars to choose from. Caladium leaves can be shaped like hearts, arrows, or lances in color combinations of red, pink, rose, white, chartreuse, and green. The brilliant foliage of this classic plant is often translucent, which makes them light up your garden. Any garden with a shady location has a perfect spot for caladiums. These tropical tubers, most of them varieties derived from Caladium bicolor, are grown for their dramatic summer foliage. They are naturals in beds with ferns or coleus, in pots to accent shady spots, or used as indoor houseplants. Although these heat loving plants are only winter hardy in zones 9 through 11, they can be successfully grown or kept as houseplants in all zones with proper management. Growing conditions vary considerably from one area of the US to another. 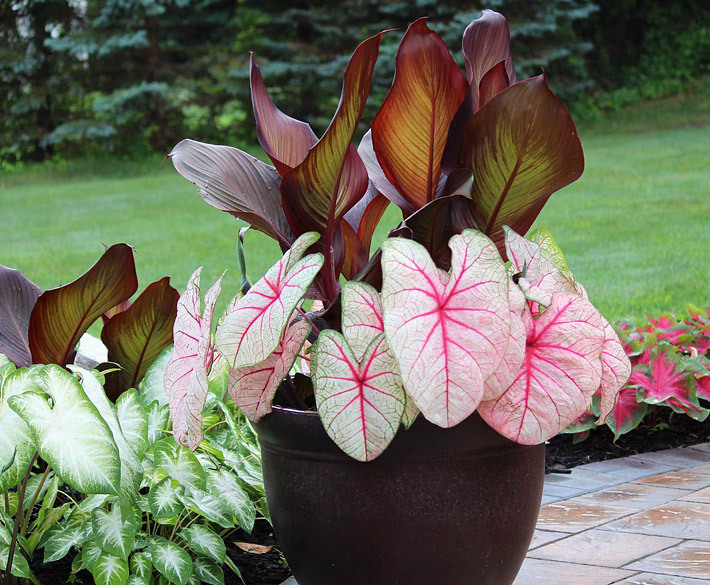 Caladiums themselves vary in size, shape, color and hardiness making it sometimes difficult to predict what sort of color and condition you can expect. Fancy Leafed Type Caladiums: They come equipped with very large and elegant heart-shaped leaves (or nearly so) on long stems. This type is usually between one and three feet tall. Lance or Strap Leaf Caladiums: These compact versions are smaller, thicker and narrower, often reaching only a height of one foot. The leaves are long and slim and more abundant than those of the Fancy Leafed variety. 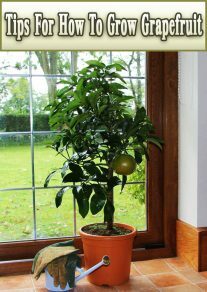 This type of plant tends to produce more leaves and make them an excellent choice for a pot or a window box. 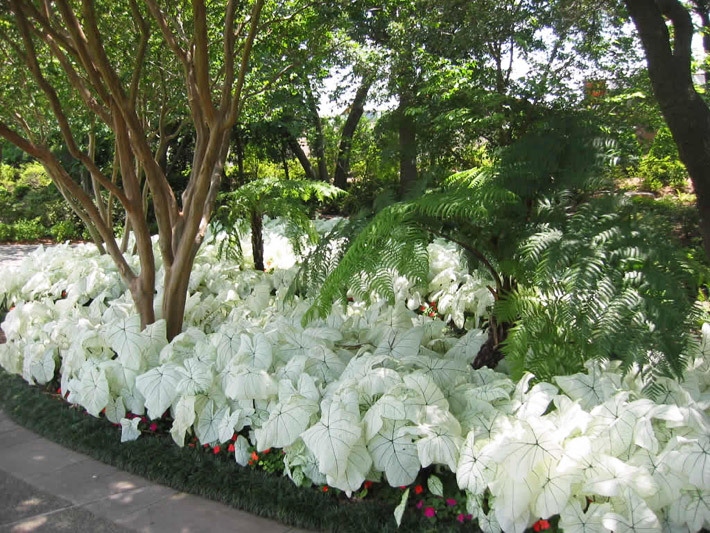 One good example of this type is the Caladium humbolti, which sports silvery green and white foliage. Other small and dwarf types exhibit very delicate and even lacey foliage. Heart-shaped leaf varieties are best for large container planting and mass plantings in large spaces because they grow tall and abundant. Choose your favorite colors and plant bunches of them for the greatest visual effect. For smaller planters, window boxes and houseplants the strap-shaped or lance-shaped types are better. They grow shorter and denser. You can also find dwarfed heart-shaped varieties, which make beautiful plants for pots, small containers, and window boxes. There is also a tremendous variety within these in color combinations. Many have very prominently colored veins and mid-ribs and margins of a contrasting color. Caladiums Bi-Color is one of the originals and has remained a hugely popular variety since the discovery of these enchanting plants. Bi-color is readily available at most garden centers and nurseries throughout the United States. 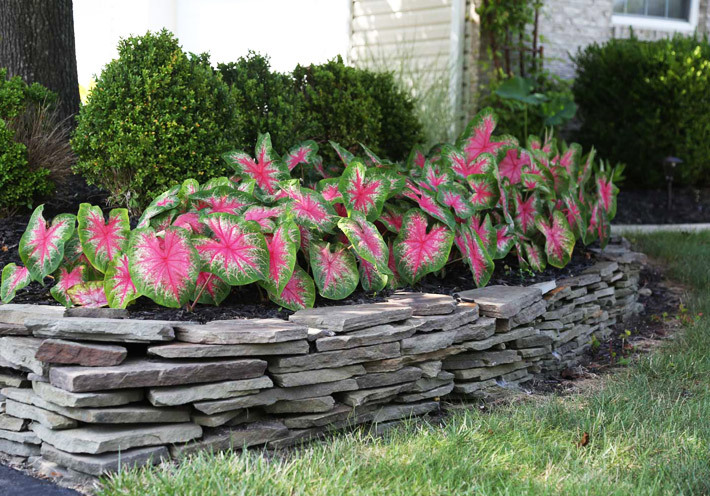 This type of Caladium has an oval or an arrowhead-shaped leaf. With so many hybrids of this type, it is easy to create a varied shady place garden. There are also stunning white and pink varieties such as Candidum. This variety does not produce many leaves because it has very few buds per tuber. Some other lance-shaped leaf varieties include White Wing and Rosalie. These varieties produce far more abundant foliage; however, their leaves are rather smaller and thinner. Some types of Caladiums have very solid, thick leaves. Still, others bear quite delicate and almost transparent leaves. In some, the colors and patterns are so intricate and brilliant they are reminiscent of stained glass. 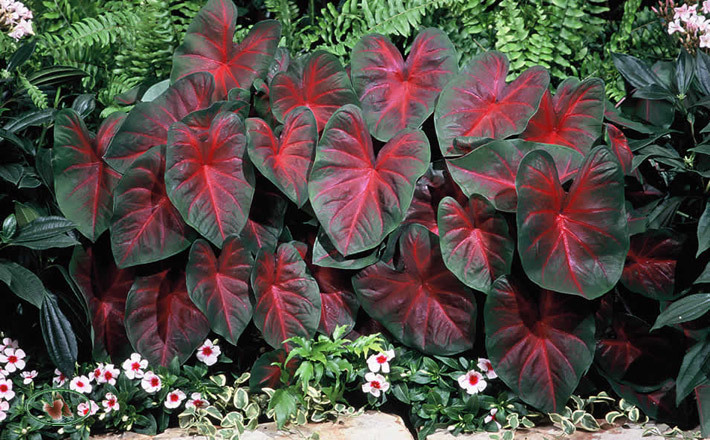 If you want an abundant, lush, tropical appearing garden, Caladiums are the ticket for you. Leaf size is also quite variable. 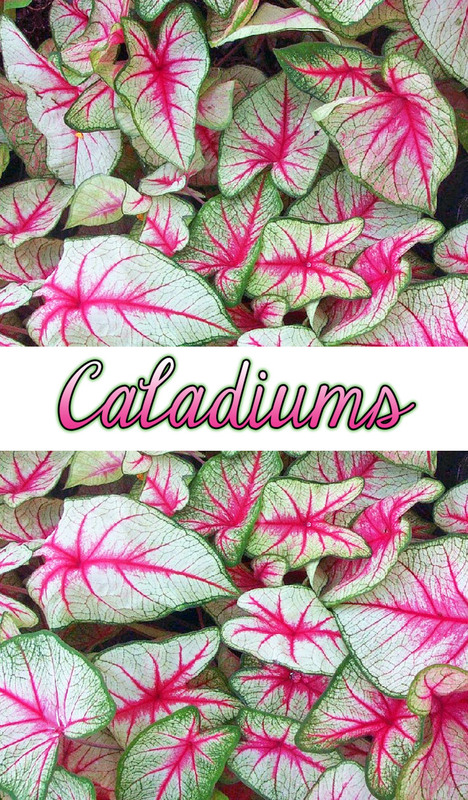 Caladiums are widely available in nurseries across the US in a wide array of colors ranging from very pale white light to brilliant red leaves bordered by green. You are sure to be dazzled by the many choices available. One rule of thumb is to plant your Caladiums after Mother’s Day to be sure there is no potential danger of frost. If you live in a very warm area such as USDA Zones 9-11, planting Caladiums is incredibly easy. 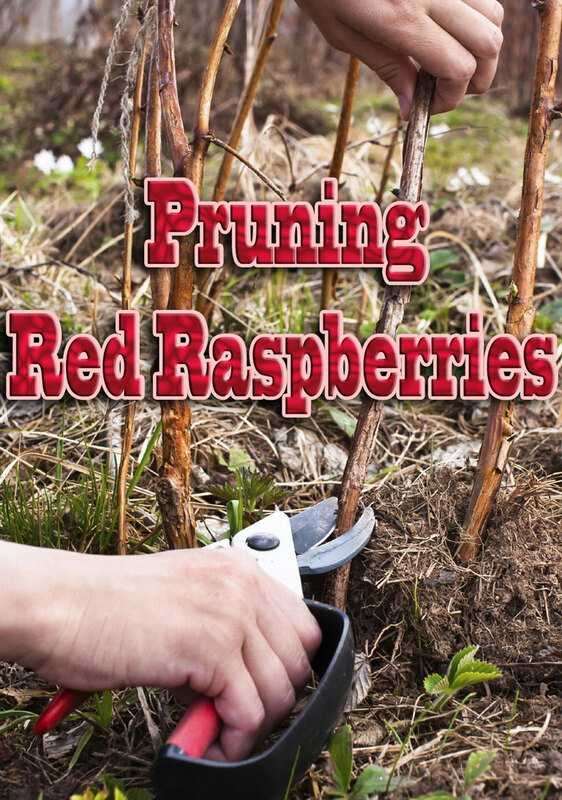 You can plant them directly into a well-prepared bed and enjoy them throughout the growing season. 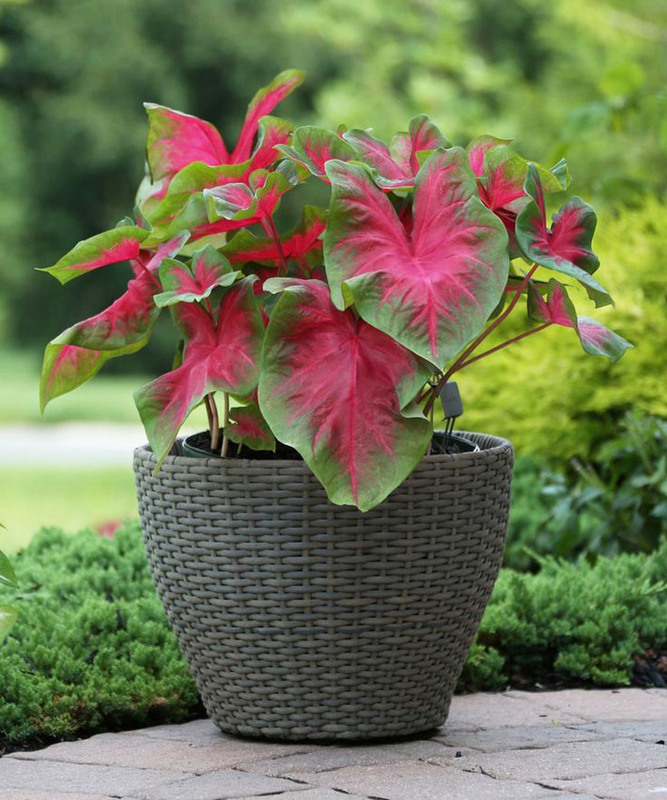 In other areas, start your Caladiums indoors in pots to give them a head start on the growing season. You can transplant them outdoors after all danger of frost passes. Light for Caladiums: All caladiums love filtered sunlight and shade. Some newer selections can take more sun. Best Soil for Caladiums: When choosing a place to plant your Caladiums look for a shady area with rich, fertile soil and good drainage to plant these tropical tubers. The best result will come from planting in soil rich in humus, with a soil pH somewhat acidic. How to Plant Caladiums: Buy potted caladiums ready to plant, or grow them from tubers. (Though they’re sometimes called bulbs, they are really tubers.) Plant tubers point side up about 1 to 1 1⁄2 inches deep. 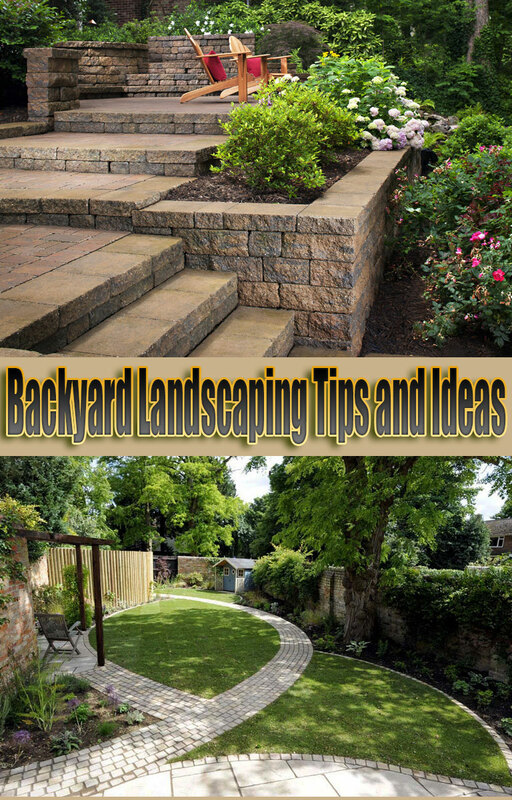 Space them 8 to 14 inches apart, depending on the ultimate size of your plants as listed on the tag. How to Water Caladiums: Remember, unlike many bulbs and tubers, Caladiums like to be well-watered. Make sure they never dry out, but also make sure they don’t get too soggy. Always water caladiums regularly. Keep the soil slightly moist. Add mulch, such as pine straw, to help retain soil moisture and conserve water. If you have caladiums in full sun, don’t let them dry out. How to Feed Caladiums: When choosing fertilizer for your Caladiums use a balanced liquid or water-soluble fertilizer. This will encourage leaf growth and discourage flower production. Recommendations range from 6-6-6 to a fertilizer of 10-10-10. With both indoor and outdoor Caladiums you must also keep a close eye on your use of fertilizer. Liquid or water-soluble fertilizer is best and follow packaging directions very closely. Do not overdo fertilizing potted and container plants as this can easily lead to root and tuber damage. Wintering Caladiums: In the Tropical South, you can leave tubers in the ground year-round. In the rest of the South, you’ll need to dig them up in early fall if you want to replant next year. Remove any remaining leaves and roots. Let tubers dry in a shaded area for a few days. Place them in dry peat moss to store. Keep them in a warm spot (50 to 60 degrees) until it’s time to replant. Clearly, decay is one of the biggest problems for Caladiums tubers. The cause of rot is fungus or bacteria and is always preceded by excessive moisture. You can identify the type of rot by its appearance. Regardless of the culprit, water-logging is the initial cause. 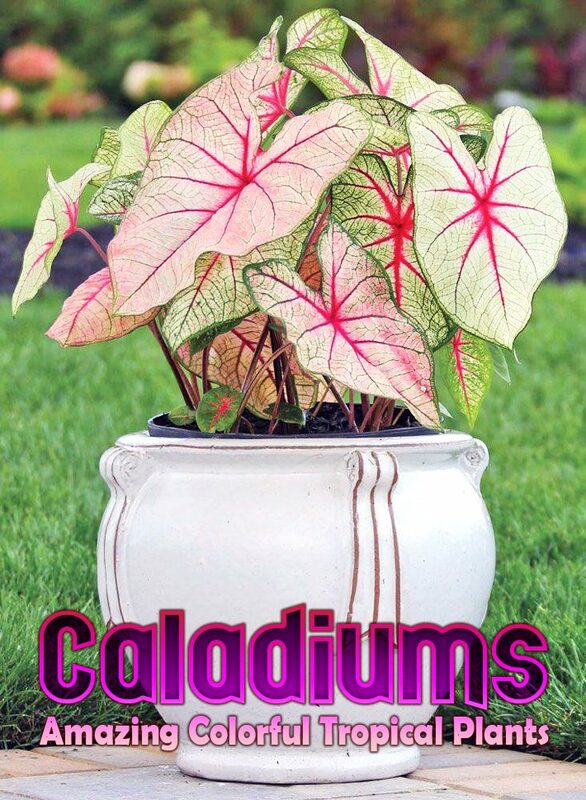 If you plant your Caladiums in light, well-balanced garden soil mix and provide the right amount of light, air and water rot problems should not be an issue. Fungal Leaf Spot: If you discover brown spots on your leaves, they might be caused by anthracnose fungus. If you just clip off the affected leaves as soon as you notice them, treatment will probably not be necessary. Be careful not to over water mature plants, and protect the leaves from backsplash. Plants with translucent, thin leaves will tend to scorch more frequently than the thicker and hardier varieties. For these more delicate types, a lack of potassium or phosphorus may show up as scorching. For older foliage, this problem may be caused by lack of water. Always water close to the ground, either early in the morning or late in the evening to prevent backsplash and excessive evaporation. Other problems include root knot nematodes. To avoid this problem, always start your tubers in pots rather than setting them directly in the ground. This helps protect them from the root knot nematode. It is also always smart to use sterilized soil when starting and planting your tubers. ← What’s Up With That: Why do Cats Love Boxes so Much?